Our store; Chesapeake East Company is located on the Wicomico River in a vintage 1929 building we saved and renovated in 2000. Our gallery/gift store is on the corner. Dana’s original paintings, prints, handmade ceramics, gift items and decor fill the store. We also bring in fair trade items, unique clothing and products for a green lifestyle. When we purchased our building from the city of Salisbury it was in derelict condition. The tin ceilings were covered or torn down, transom window covered with plywood and everything was in extreme disrepair. As two independently employed artists we did get in over our heads, but 18 years of hard work and creative solutions has resulted in a truly wonderful building full of nice folks. Our original intent in renovation the building was to create a Corning Glassworks type destination where visitors could watch us handmade Dana’s designs in ceramic- see us paint/decorate each and finally visit the shop and take home a treat. We employed 15 artisans when we opened and sold to 400 galleries nationally when we opened in 2000. Unfortunately a number of factors including cheap knock offs of our and other American craftspeople’s designs flooding the market from China, combined with the demise of small independent shops and galleries marked the end of an era for American Craft. We have evolved with trends and are very happy in our present state of small, green, local and handmade. Each business here at 501 West Main Street is run by makers. Made here in Salisbury, Maryland with pride! Our shop contains everything you find on our website and more! 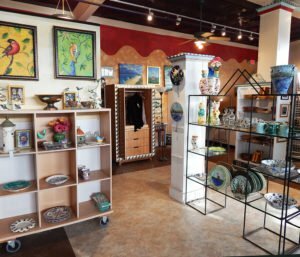 There is also wonderful artwork and fine craft by local artists, fair trade items, and unique finds. Stop in and say hello!